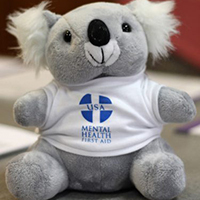 Santa Fe Community College in partnership with CYFD will host two opportunities to attend the Mental Health First Aid training course on campus. In this 8-hour training, participants will learn about the potential risk factors and warning signs for a range of mental health problems. Trainees will become familiar with a 5-step action plan to help an individual in crisis or connect them with appropriate professional care. The training will be offered Thursday, April 5 and Friday, April 6, 8 a.m. to 5 p.m. This one-day course is free and open to the public. Space is limited. To register, please call 505-428-1907.